Center For Siouxland has Super Saturdays available where you can walk in no appointment needed! File your taxes for FREE! 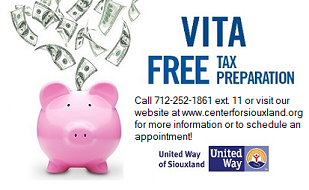 If you earned $55,000 or less in 2018, Center For Siouxland’s Volunteer Income Tax Assistance (VITA) program provides FREE tax preparation and filing by IRS-Certified Volunteers. Check our website at centerforsiouxland.org for more information or call (712) 252-1861 ext. 11 to speak with one of our trained specialists who can give you more information or help you schedule an appointment. We will have Super Saturdays where you can have your taxes done with no appointment – walk-ins are welcome! Super Saturday services are available at Center For Siouxland’s office located at 715 Douglas Street, Sioux City, Iowa from 9 a.m. to 2 p.m. on Saturdays February 2through April 6, 2019. Please be sure to bring along the required information needed to complete your tax return. Golf 19 beautiful local courses for just $79.95 with the 2019 Siouxland's Best Golf Card. On sale now online here.